Welcome to Chapter 1 of Tales of Berseria. 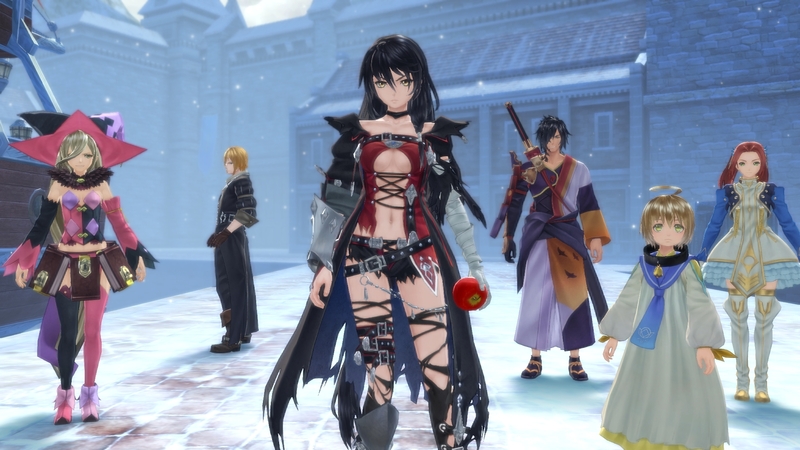 Here, you learn of Velvet Crowe's story and how she became half-Daemon. Here marks the beginning of her revenge against Artorius. Stats will be updated as we go along. 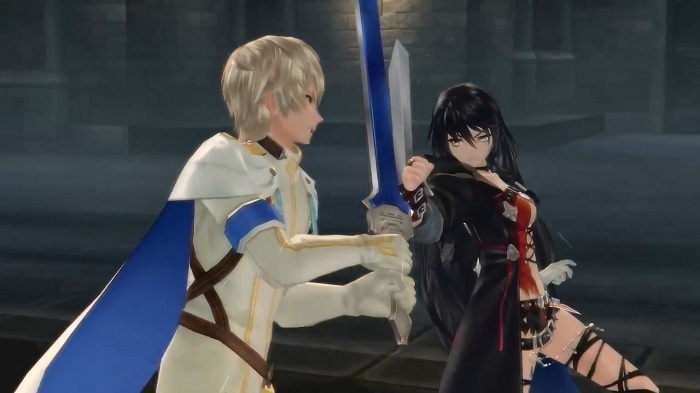 Welcome to Chapter 1 and to the world of Berseria! As the prequel of Zestiria, this game will reveal as to why Zestiria is the way it is. There will be some Easter Eggs coming from Tales of Zestiria. However, in Chapter 1 – this part is pretty straightforward. Like all games, the Chapter 1 will always contain some tutorials for you to follow. When you finish the tutorials, it’ll help greatly in your battles especially in trying to make strategies to take down the next big baddie. Chapter 1 starts with the prologue of Velvet’s life. How did she become a half-Daemon? Why is she so angry? What’s her main motive in life? All this can be explained in Chapter 1. Before we get to Chapter 1, there’s always the prologue. 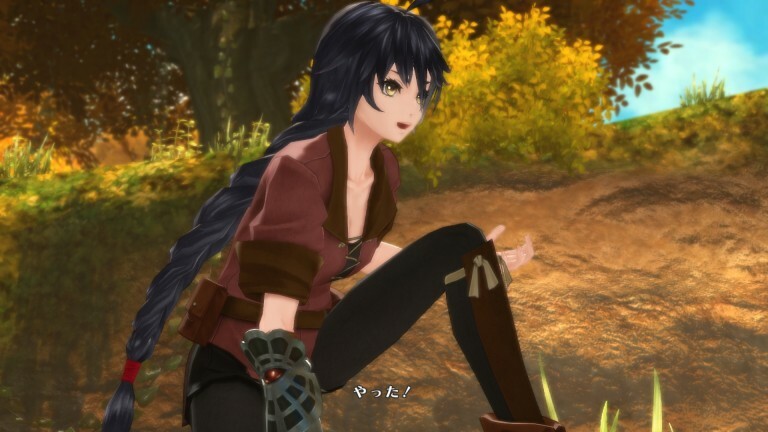 Velvet Crowe can be seen talking to Arthur, her sister’s brother-in-law. Because he has some business to attend to, Velvet instead decides to take on a request. She heads out to choose a request and chooses the request to hunt a few boars that have been messing with the village. Once defeated, she plans to use the money earned from the request to get some money for her brother Laphicet. Head north to the next area and speak to a little girl sitting on the stones. There, Velvet says that she’s planning to make boar stew for her brother-in-law. The little girl also mentions how she’s seen Laphicet talking to himself. Velvet assumes that it’s probably Seres that he’s talking to. Head down the main path and talk to the man crouched down. There, you learn that it’s been 7 years since the Scarlet Night. The Scarlet Night ushered in a terrible plague of Daemonblight that turned majority of the villagers into Daemons. Speak to another girl who hopes she can play with Laphicet again when he gets well. After talking to the people, Velvet will remind you to stock up. At the south point by the well is a chest with APPLE GEL. Head to the item seller, there’s a RESIST RING in the chest beside him. No need to buy however since you have 200 GALD along with 4 APPLE GELS in storage. Across the item seller, you’ll find the save sphere nearby. One of the exits are blocked so, you can ignore that. Speak to the granny who says something about the village being punished and that Velvet is already 16 years old. After that, take the exit. Head north and make a turn heading east to find the shiny spots. After picking up at the shiny spots, backtrack and take the south path to the first gold star on the map to encounter the first boar. After taking down the first boar, head south. Since you can’t jump the gap, follow the path to the next star. When you’re done finishing off the second boar, head out to pick up the Apple Gel nearby. When you head north, there’ll be a boulder. But you can’t do much about it so just use the Save Sphere nearby and proceed on. After killing the third boar, there’s an occurrence of Daemonblight which Arthur cuts into the battle and saves Velvet. He says that he’ll be the one to deliver the boars while she heads back to the village to collect the medicine. There’ll be a cutscene where Velvet asks if she can be an exorcist. Arthur however tells her that people who can become exorcists are those with a certain power. The only problem was that many people who have that power were already dead and finding people who had that power are rare. After heading back into the village, Velvet finds out that the medicine hasn’t been restocked. However for her trouble, the merchant gives her free 3 more Apple Gels in return. Having a total of 7 Apple Gels, you’ll now notice that the merchant will be selling weapons. However, it’s impossible to buy at the moment considering you only have 200 Gald. Head home and trigger a cut-scene. Velvet promises to buy flowers for her parents’ grave the next day and she checks on Laphicet. Her younger brother promises to become an Exorcist, find a Malak, and create a world where his sister could live in without fearing Daemons. Start the fire in the fireplace. You can check the two books lying on the dining table where you find two of Arthur’s books. Velvet recalls seeing Laphicet reading one of the books while spotting Arthur’s diary. She reads it and finds a comment about her needing to up her feminine appeal. After that, head up the ladder and check for the other books up on the shelf. When you’re done, check on Laphicet in his room and head down to the kitchen counter. With that, you can start cooking. Run into the village to trigger a scene. Laphicet is missing and nobody has seen him save for the merchant. Talk to the merchant and he’ll mention about Laphicet trading his book for something else instead of a compass. Talk to Nico and try to borrow the dogs. Unfortunately, the dogs are going to refuse to go with you. You can speak to some of the guards for additional info. The guard at the west exit comments about Laphicet being increasingly brilliant while the guard at the east exit warns that another Scarlet Night is coming. After that, find Laphicet. Upon finding Laphicet, Velvet will decide to take him to see the ocean. She also warns him the next time he runs off, she’ll tie him to the bed. Take note of the save sphere at the side. Head to the cliff area for another scene and engaged into a boss battle. Here, all you have to do is survive long enough for Arthur to show up. Your attacks won’t have any effects on them. After that, Velvet passes out and lets Arthur save the day. Laphicet helps her up and vows to her that he’ll make a world for her where she can be happy. After gaining control back, Velvet realizes that it wasn’t a dream. Head out for a scene where Velvet will start talking to both Laphicet and Arthur. At this point, you won’t be able to fight any of the daemons just yet. Save and then head out back to the cliff. When running to the cliff area, you find yourself fighting another bunch of Daemons. This time however, you can inflict damage on them. After defeating them, Velvet finds out that the reason why she was able to hit them was because they were the villagers. This proceeds to infuriate her even further. With that, the prologue ends. Seres will drop out from the sky in the middle of nowhere, challenging Velvet into a battle. Without much on you, this will be a hit and run strategy. Have Velvet move around and inflict as much damage as you can. Dodge roll and make sure you don’t take too much damage. If you need to heal, make sure you’re far away to use the Apple Gel. Defeat her and you’ll get into a cut-scene. There, Seres reveals that she no longer serves Arthur or whom she refers to as Artorius. Velvet says she doesn’t care only demands for Artorius’ location. Seres explains that the ritual he attempted 3 years ago was incomplete. While he did manage to call a few Malak, it still isn’t complete which gives Velvet the time to kill him. Seres promises that if Velvet breaks out of prison, she’ll tell her everything she knows. From your starting point, make a right and check for shiny spots. Do so on the other side. After picking up your items, head into the only exit available to the storage room. Open the chest in this room to pick up some items. Among them: there’s a rope, and a weapon, and certain items she makes into clothes. While doing so, you’ll be interrupted by an exorcist. Exit out the other door and use the save. Take the south exit, you cannot use the north one. You’ll be introduced to Katz which will be useful later on opening Katz Chest. It comes in handy so pick it up and collect any from now on. In the next area, pick up Katz, and then watch the scene up ahead. The exorcist knows something’s up. Rush out towards the next exit. After that, Velvet will cause a commotion with two names popping up: Van Aifried, the only prisoner to get out and Melchior. Check all the halls and cells to grab some Katz and Shiny Spots. You can talk to the goblin daemon in the back of one cell. Head back out the way you came for a scene with Magilou and let her grand entrance happen. After her grand entrance, you get to access the other doors. Take the south one and pick up a Sage. Enter the room to the east and search around for any goodies and a Life Bottle. Go back. Take the north door and access the stairs to the next area. Pick up WIND RING, and use the save. Keep going up for another scene before coming up for a boss fight. Beat him down and then give him some information in regards to a sword. After that, he’ll bolt off and give you time to start looking for items. Take the south path until you come across an Orc. Collect the two Katz and continue on the only path. There will be another scene and a fight right after. When you’re doing winning the fight, climb the ladder and pick up the chest with 320 gald. After that, climb up to the top to start another scene. After the cutscene, you’ll pick up the Katz nearby and a Verbena herb. When you’re done with that, use the Save Sphere nearby. And when there’s a save spot, there’s a boss fight coming up. 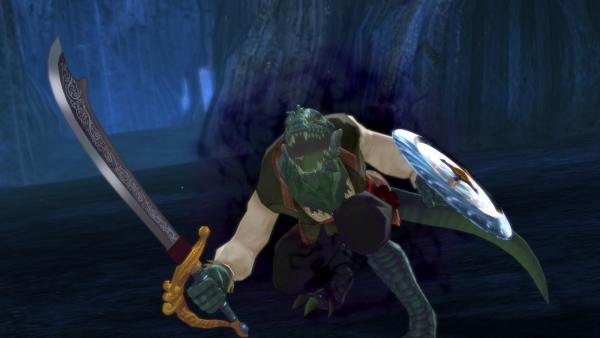 Run forward into the next scene where you’ll meet the resident bishounen (AKA Pretty Boy) of Tales of Berseria – Oscar Dragonia. Take out the Spearman and the Staff User first as they are the ones with most blatant weaknesses. Deal fire and earth damage to them both respectively before pounding it out with Oscar. Smack down Oscar and when he goes down, one of the Malaks go crazy. After the Malak goes crazy, Seres asks Velvet to devour her and take her power. The girl does so and brings down the Malak before making her escape. Velvet and Seres speak on how things happen. The former says she doesn’t care what happens to things anymore and only wants Artorius to pay. Seres understands and explains that she doesn’t need her apology and whatsoever. And that, she still dreams of Velvet, Artorius, Laphicet and her living together in peace. Watch all the following scenes first. Chapter 1 has a lot of cut-scenes and also a lot of boss battles. Although in this case, you won’t have Seres anymore. In replacement for Seres, you have both Rokurou and Magilou. After escaping the prison, you receive “The Beast Uncaged” achievement. When you receive the achievement, you’ll find yourself lying on a snowy field. Suddenly, Velvet is awakened by a Daemon and you’re made to fight it. After fighting the Daemon, you’ll notice that a kid has disappeared along with the compass. But in the process, you are left with a map. Check the area and pick up 320 gald from the chest. After that, use the Save Sphere and move on to explore the area. Hug the right wall and pick up 3 Katz. When you’re done clearing the area, Eagles will swoop in and attack to trigger the Escape Battle Tutorial. Note that Rokurou and Magilou are not part of the party yet, so they’re just tagging along as guests for now. Head along the west wall where you reach the edge of a cliff. There, you can pick up the Rosemary. Head towards the exit and you’ll get a long chat. Ignore the exit and turn around so you can go up the east side of the map. There’s a Life Bottle in the chest. At the moment, you can’t reach the other chest so proceed to talk to the Katz down below. The Katz will tell you that the spirit matter you’ve been collecting is in essence, Katz souls. The Katz request you to collect their souls and in return give you the rewards in the Katz boxes. You get a COWBOY HAT to celebrate. Move on to the next area. When you hit the next area, the kid will return the compass and then run off. Run after him and follow him into the other paths. When the path opens up, hug the left wall and climb the vines for Sage. Follow the main path to a save point and go up the ladder. When you reach the storage room, Magilou notices a few materials such as Melchorite which is used in making bombs and stuff. When you’re done, pick up Life Bottle and 480 gald. Exit towards the southwest end. The area will have a Fire Ring and some Katz: one near the kid with a “!” and the other near the barrels southeast from you. At the dead end heading north, pick up the Life Bottle. Check the crates for a few more Katz before heading into town. Turn right into the alley for two Katz and you’ll find a Save Sphere at the church. Look for the kids and the Katz should be around there. Run along the fence for a few more Katz plus follow the path behind the house to find another. While you’re there, pick up the Lavender lying around. When you climb the ladder, there’s 4 Katz and a BLOOD BLADE. Run to the start but this time, head south. Go around the house and into the alley for another Katz Box. This triggers a cutscene. Using 15 Katz, you’ll be able to open the box and get the Square Framed Glasses. Talk to the guy with the star on his head to trigger a scene. There, you’ll meet Teresa who tells you that the ships aren’t allowed to run until the Abbey captures Dyle. Velvet tries to persuade her to no use. Head along the north wall to find a Verbena herb nearby a horse and cart. Pass through the arch and make an immediate left behind the houses for a chest with Amber Fragment. After that, head back onto the main road and enter the first building on your right. Talk to the fanboy at the corner to learn about Teresa. When you head up to the balcony, pick up another Katz. Head towards the inn to save and pick up a Katz. When you’re done, Magilou leaves but Rokurou joins you. When you’re done, head back to where all the ! are. Grab the last one at the Harbour. Head back out on to the field through the storage room. With that all done, you can now explore. There’s some Katz at the west side; there’s also a Chamomile up there. Slide down the ice to pick up all those Katz. Ignore gold star for now and go north. Cling to the east wall and grab the Life Bottle from the chest. Since the vines are frozen, head north to the !. Check out the flowers for a flashback. When finished, head towards the golden star and meet another peculiar character, Eleanor Hume. After that, someone will inform you that the Lizard Daemon is up north and bribes you for silence with apples. Go up the hill in the south to the first ! and get Rokurou blasted by stinky cow breath. There’s also some Katz lying around near the fireplace and near the cow. After that, look for the chest with 450 Gald. Go up the slope beside that for Saffron. In the gold chest, there’s the Twin Blessings, an accessory armour for Rokurou. Grab the two Katz near the Katz box which needs another 15 Katz to open. You’ll find another box but won’t get much out of it though. After heading back to the ground level, enter the inn and talk to the innkeeper for a long chat. When the chat’s over, spend 100 GALD and in return get a shirtless variation costume for Rokurou. Grab another Katz by the fireplace and when you head out, there’s a Katz and a Rosemary right outside the item shop. If you talk to the other ! guy, he’ll mention that the village has been abandoned by The Abbey. It’s a rare moment that Velvet shows empathy and knows that The Abbey is neither absolute or almighty. Head out the north exit, the old man there will stop you and teach you cooking. When possible, choose the second option to eat. After that, follow the prompts. When finished, pick the first option and receive the ingredients and the recipe. Head out and use the save then enter the cave. Collect three Katz north of you and ignore the dead end. When you’re done collecting, head northeast for a chest with Apple Gel. Turn back but this time, take the south path. In the next room pick up a Katz along the wall. After picking that up, head towards the west and to the dead end where you’ll find a chest with 500 Gald. Turn around and head north before finding a boulder. Unlike before, you can now smash the boulder. Open and spend 25 Katz to open the Katz box for some Katz and a Rose Corsage. When you’re done, take the north path to the next area. Head forward and pick up 2 Katz. Continue heading north, jumping over rocks, and collecting some more Katz. In this next room, there’s 2 Katz against the east wall. Take the lower west exit, at the end of this room are some shiny spots, 12 Katz, and a chest with Shadow Knives for Rokurou. Return to the last room and head to the east where there’s a dead end. Collect 5 Katz and a Chamomille. Head to the upper west exit, pushing the boulder into the sludge so that you can jump over. Grab the Katz on the way and exit. In this next area there are some shiny spots, and a chest with Life Bottle. There’s also a bat daemon here with a dark aura. Beat down the Bat Baron with Soul Break and you’re good to go. After that, go down and around for another long chat. Go to the other room and pick up more Katz and a Sage. Take the exit to the next area. Jump across and collect 2 Katz. Further up, push the boulder in and jump across for 2 more Katz. Another long chat takes place. Advance to the last area with the save. Break the boulder to the south and collect shiny spots, 7 Katz, and 530 Gald. Ignore the warp point and use the save. Head towards the upper exit. After the fight, grab 3 Katz, LAVENDER, and any shiny spots. After that, talk to Dyle and you’ll receive a Denole Bottle. Don’t use it just yet. When you’re done with the dialogue, head out to the last room where you can take the warp. Grab the warp and head south to leave the area. Return to Helvisa and head to the main area with the crowd of sailors. While in the area, talk to girl with the ! by the church to get some information on volcanoes. When you’re done, head to the guy with the golden star. In exchange for fixing their boat, Velvet will keep the guy’s dirty secret safe and leave. While in Helvisa, Rokurou will teach you how to upgrade your weapons before heading back to the ship. You’ll get two more long chats. Talk to the guy with the star in font of your ship and you’ll find it unfixable. The next scene features Oscar and Teresa which reveals that they are siblings. When you head back to Helvisa, you’ll receive a warning from the guys outside the city. Velvet wants to steal Teresa’s ship using Dyle. So, head back to the dungeon and use the warp to get to Dyle. Talk to Dyle and she’ll dish out her plan. Since Teresa is holding Magilou as hostage to lure Velvet into a trap, Velvet has a plan that’ll secure them a ship. As for Magilou, she’ll be on her own. When everyone takes a rest, Velvet dreams of her brother, Laphicet. When the cut-scene ends, return to the entrance with the warp. Save outside the dungeon and then head straight to Helvisa. Fight the guards at the gate before heading inside and straight into the main area. This triggers a cut-scene and a boss battle right after. Take out the Malaks first since they’re the lowest on life. Teresa will be a bit of a problem later but if you spam your Soul Gauge, you should be fine. After defeating her, watch the cut-scene. Just when you thought that was over, another Boss Fight shows up. The pirates reveals themselves to Malaks and demand you defeat the captain. When the scene finishes, grab the 3 Katz behind a rock. Speak to Benwick to stock up. After buying items, talk to Magilou and Dyle before proceeding into the grotto. When you’re finished, grab the EARTH RING and the Katz. Don’t forget to save. First, head into the dead-end room with SMALL ORE. Don’t forget to collect Katz before you leave. When you reach the gold star, Eizen introduces himself and he joins the party. After that, exit to the next area. Head towards the dead end and pick up AMBER LEAF. When you’re done, head east and burn the roots blocking your way. While in the next room, take the east exit before heading southeast end to burn some roots to pick up a bunch of Katz. After that, head North where Eizen reveals that Malaks rarely have free will. Ignore the west exit and head east. When you get there, burn the roots and grab the Life Bottle from the southeast end of the room. After cleaning up the loot, head back and take the west exit this time. Next, grab the Katz Box worth 35 Katz. After opening the box, burn the roots to head north. When you’re finished, don’t forget to save and proceed to talk to the White Turtlez. After that, head to the exit and to trigger a scene. When you finish that part, head out and you can trigger a dialogue about Turtlez with the guys. Ignore the roots and take the east exit. There’s a warp here and a chest with 640 gald. After that, head back and burn the roots facing north. Keep going north and burn the roots until you reach a chest with the Mercury Pouch. Head out the exit and trigger a scene. Upon entering, you’ll hear some jumpy music. But that doesn’t matter. Jump down when possible heading north. There will be a scene, there’s a barrier at the door. You cannot approach the southern wall but you can fight some of the enemies here. The flowers are also enemies. When you’re done grinding for EXP, head north to continue. Pick up a Verbena along the way. After that, keeping jumping down until you have to fight two lizardmen. After defeating them, note the Save Sphere. Before heading inside, grab the chest by the water that has a Life Bottle. When you’re in the area, head north and then, go around the west corner for some Katz. After that, go down the other path and up some ladders which triggers a scene. When the scene’s over, use the save. Since you took the hatch, head for the door instead. Go up the plank and walk along the edge of the building to reach the other side. When you’ve crossed, head through the door and grab the chest with the Life Bottle. After you’re done looting, climb the ladder. In the next room, there’s a Verbena at the other end. Go down the other hatch and go out the door. In the middle of this area, there is another door with a !. You need to enter this room but it’s locked from the inside. You’ll have to find another way in. Head up the vines beside the door and pick up some stuff. Jump down from the other side to grab the Earth Ring. Go in through the window to trigger a scene and then head back to the room with the save. You can exit out the front door now instead of the window. When you head back to the save point, take the south door and at the end of the hall is a chest with LIFE BOTTLE. Head back and go north this time. At the end behind some crates is a chest with 680 gald. off. Before heading back, walk along the edge and pick up a chest with Plain Paper Leaf. Go back down the hatch and across the cleared path and through the door. Head out the other exit and pick up a Denole Bottle behind the crate. Head south and fight a battle. Take out the summons first and then the exorcist. Watch the scenes and then head back to the room with the save. Might want to use it too. Check the door in red for a long chat. Head through the door after. Pick up a Lavender at the end of the walkway and go up the ladders and through the door. Move forward for a scene with a lever. Head up the ladder and go down the hatch on the other side. Lower the lever here. Watch the gate open. Go out the door and collect some Katz. There’s also a Katz Box here. For 35 you get a Katz and the Blush. Back inside, head up the ladder for a scene. When fighting this guy, you’ll have to rely on elemental attacks since he has high resist to Normal Damage. Have your characters fight via Arcane spells and rely on a hit-and-run strategy to take him out. After that, you’ll find that the runaway Malak now has the name “Laphicet”. When you finish that part, congratulations! You have now finished Chapter 1! Actually, the majority of Chapter 1 is more of a tutorial where you learn the controls and explore the many worlds that you’ll be running around in.